Frederick Wiegand designed a deepwater drilling engineering course, from previous teaching and wellsite supervisor experience, and presented the course in Mexico City in March 2013, entirely 99% in Spanish. This helped the Mexican oil and gas industry promote the excellent deepwater drilling blocks available under EPN's Nueva Reforma Energetica laws of 2014. 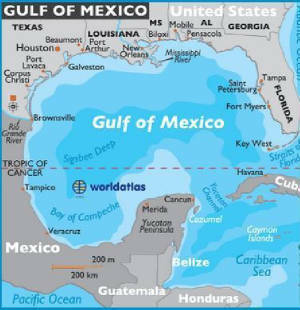 Gulf of Mexico produces alot of crude oil, natural gas, and condensate. The Mexican GOM may have more oil and gas than the US GOM, but we need a couple of 6th generation drillships down here soonest. WHPSA wishes to contract a drillship soonest. WHPSA = Wiegand Hermanos Perforadores Sociedad Anonima, a Mexican corporation founded in 1949 by the Wiegand Brothers. News of the Mexican oil and gas industry, from OTC in Houston, TX, USA during first week of May 2014. Pemex is preparing to transform itself from a national oil company into a "state-owned, production company," said Director Hernandez-Garcia, acting director of PEP, at OTC in Houston, USA during the first week of May 2014. Although the Mexican government will still own the national oil company, Petroleos Mexicanos PEMEX wil no longer have the exclusive rights to develop oil and natural gas in the country of Mexico. This is due to a cultural change, said the Director of PEP. CFE ComisiOn Federal de Electricidad will soon be completely responsible for the exploration, drilling and production of natural gas in all of Mexico. This will require more technical expertise from Mexican nationals and expatriates, too. As a monopoly, Pemex acted for 75 years as an administrator of Mexico's oil and natural gas reserves and resources and production, with steady declines in production over the past few years and increasing deficits. Additional legislation was submitted to the Congress of Mexico circa 30 April 2014, and is under review by lawmakers, to determine how to implement the reforms. The proposed "fastest and easiest" way to implement the reforms is for the Mexico Congress to immediately shift ALL responsibilities for the natural gas industry to the ComisiOn Federal de Electricidad CFE, which will require a NEW group of experts and setup a new competitive national natural gas company, MEX NNGC, which will audit Pemex. This shift to CFE away from Pemex will hopefully ensure financial and contractual stability to attract international investors to Mexico, to help stop the decline of production, to help discover new oil and gas fields, and to increase the production of oil and gas in Mexico to previous levels, and more, hopefully more than 3 million BOPDE.